mad orange fools: On the list of things to make. The Jane Hat. 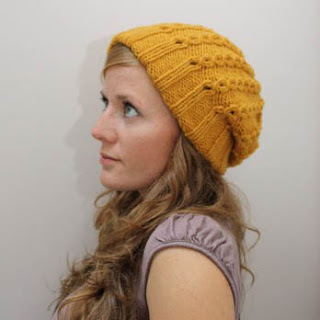 Not that I really need another hat, but this one is too cute and I need some smaller projects to do. Also, this is one I can make with yarn from my stash. Right now not spending anymore money is a good thing. Yes, another top down sweater! By the same designer as the Cozy Bolero. (Obviously I am much attracted to Jane Richardson Designs.) This one looks like it will be a more flattering fit for me plus if I need to change the length or anything, it'll be a snap to do. I don't have the yarn for this one yet, nor the needles, but I am hoping to get to it in the next couple of weeks. I've also been wanting to make myself a cowl and I think this is the one that I am going to do, the Tuesday Night Cowl (Ravelry link). I like the chunky look and I have some bright turquoise blue Malabrigo Worsted in my stash that I can use. I might start this today, but I haven't decided yet as I also need to get back to work on some new designs for the shop.